The GMV Environmental Economics and Policy group work consultative with the mission to use science to promote sustainable development within the universities' three responsibilities: research, education and collaboration. They collaborate with agencies and organizations and provide analysis, assessments, investigations and advice for sustainable development. The staff has its background in environmental economics and combine researcher experience with long experience of working with government authorities, industry and NGOs. 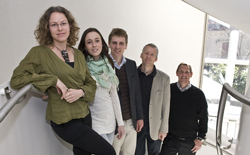 GMV’s Environmental Economics and Policy group has long experience of research based advice. Since 1991 they have provided advice to Sida, lately formalized and provided via an Environmental Economics Helpdesk, with the overall objective to support integration of environmental and climate change risks and opportunities’ in Swedish development cooperation. Over the years they have also collaborated with organizations like the World Bank, EU, UNDP, OECD, The Swedish Environmental Protection Agency and other Swedish government agencies. Their advisory services are commissioned and financed by their mandators and principals. Their group consists of a core team of five environmental economics specialists. The work is often conducted in collaboration with colleagues at the Environmental Economics Unit (EEU), the Environment for Development (EfD ) centers, the GMV network and the Swedish University of Agricultural Sciences in Uppsala (primarily through Sida’s Helpdesk for Environment and Climate Change), or in collaboration with other actors.